1865 – 1866 – Speirs, Alexander, of Speirs & Gibb — house, 5 Caledonia Street. 1865 – 1866 – Gibb, Andrew D., of Speirs & Gibb — house, 23 Oakshaw Street. 1866 – Alexander Speirs, Bellvue, 17 Main Street, Castlehead, Paisley – Speirs & Gibb Coal Merchants & Fireclay Manufacturers, Stoney Brae/Underwood Depot. 1869 – Speirs Gibb & Co, 10 Canal St, Port Eglinton. 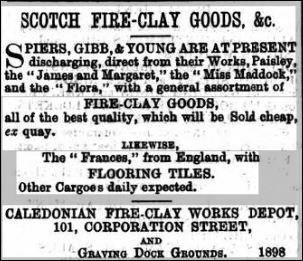 Below – 31/07/1869 – Paisley Herald – Speirs Gibb & Young, Caledonian Fire Clay Works open a depot in Paisley. Below – 05/05/1870 – Northern Whig – Speirs Gibb & Young, Caledonian Fire Clay Works open a depot in Belfast. 13/08/1870 – Paisley Herald – The smoke nuisance – The minutes of the Sanitary Committee showed that Mr Bell, Mossvale Cottage, had complained of the smoke from Messrs Speirs and Gibb’s fire-clay works. Mr Ronald was requested to have a personal interview with the Messrs Speirs and Gibb, with the view of prevailing on them to remove any cause of complaint. 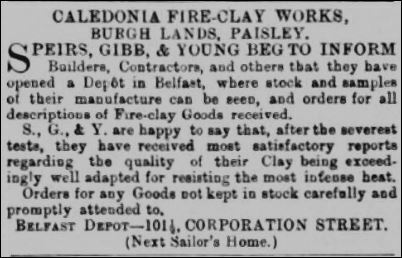 Below – 28/03/1871 – Belfast Telegraph – Speirs Gibb & Young, Caledonian Fire Clay Works advert. 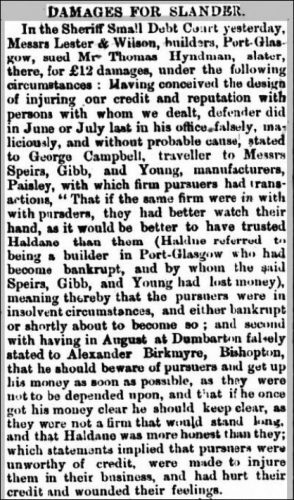 15/07/1871 – Paisley Herald – Smoke nuisance – Council chamers meeting . 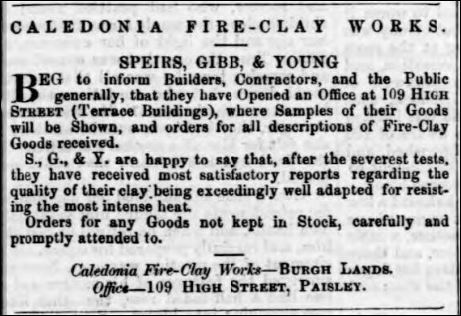 …The clerk has been instructed to write to Messrs Speirs, Gibb and Young calling their attention to a complaint as to the smoke issuing from the Caledonia Fire Clay Works. 1871 – 1872 – Speirs, Gibb, & Young, sewage pipe and fire-brick manufacturers, Caledonia works, Paisley; depot, 16 Wallace street, south. 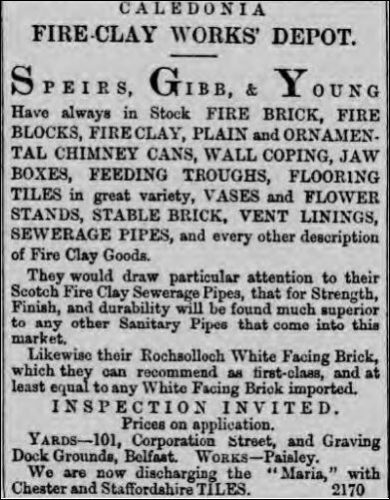 Below – 16/03/1872 – Belfast News Letter – Speirs, Gibb, & Young goods for sale including Rochsolloch white facing bricks. 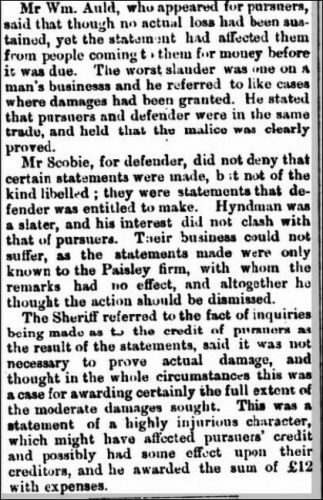 Below – 14/11/1872 – Greenock Telegraph – Slander trial. 1872 – 1873 – Speirs, Gibb, & Young, sewage pipe and fire-brick manufacturers, Caledonia works, Paisley; depot, 16 Wallace street, south. 1874 – Priory Park, 19 Main Street, Castlehead, Paisley – John Young & Co. Timber Merchants, Burgh Saw Mills or possibly it is John Young of Heathfield and Cardowan Works but he used to be in partnership with Hurll and from this link Hurll and Young were together between c.1861 – c.1873 so it is unlikely Young was in partnership with Speirs and Gibb at the same time. 21/02/1874 – Paisley Herald – Speirs Gibb and Young have removed their office from Terrace Buildings to their works, Burgh Lands of Greenock Road by Caledonia Lane. 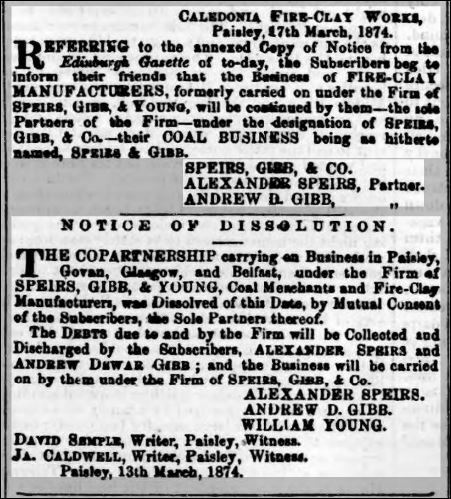 Below – 21/03/1874 – Paisley Herald – Speirs Gibb and Young partnership dissolved. William Young leaves the company on 13/03/1874. Below – 03/06/1874 – Northerm Whig – Speirs, Gibb and Co, Caledonian Fireclay Depot, 101 Corporation Street, Belfast. 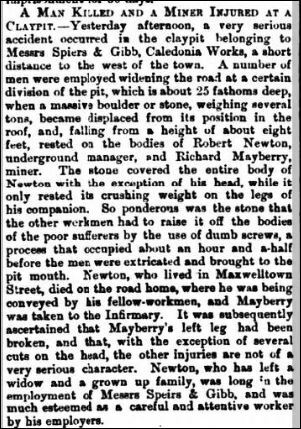 Below – 29/09/1874 – Greenock Telegraph – Fatal accident at the Caledonia clay pit. 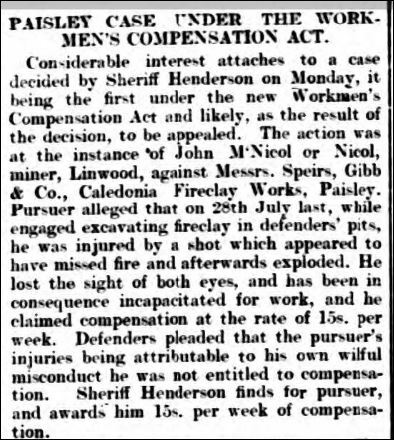 10/07/1875 – Paisley Gazette – The Smoke Nuisance.—On Tuesday, at the instance of the Local Authority, the complaint against Messrs. Spiers and Gibb, Caledonia Fire-Clay Works, for non-consumption of smoke, was again before Sheriff Cowan. Mr. Gibb appeared, and stated that the new boiler, for the insertion of which the case had been continued when first brought into court, was still in the hands of the makers. He therefore asked that further continuance be allowed. The Sheriff agreed to the request. Below – 24/08/1875 – Northern Whig – Speirs Gibb and Co advertising goods at their depot in Town Hall Street ( Old Posk Market) Belfast. 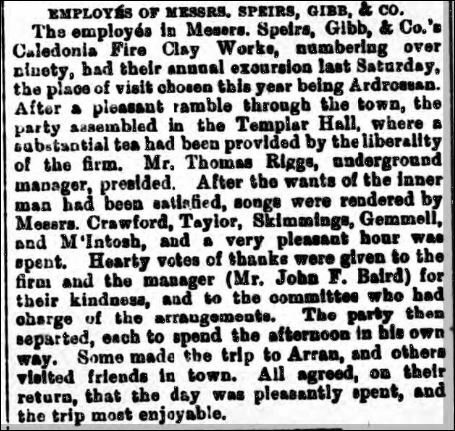 26/02/1876 – Paisley Herald – Speirs Gibb and Co, Caledonia Fire Clay Works annual outing was this year held in the Adelphi Hall. Mr A.D Gibb presided along with Mr Alexander Speirs. 1877 – Morven, 10 High Road, Castlehead, Paisley – Andrew D Gibb – Speirs & Gibb Coal Merchants & Fireclay Manufactures, Stoney Brae/Underwood Depot. 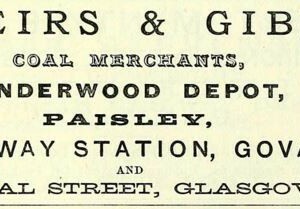 Below – 1878 – Advert – Speirs and Gibb Caledonia Works Paisley. 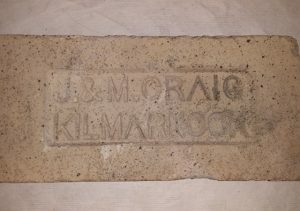 1882 – John Baird, agent for Speirs Gibb & Co, fire brick manufacturers, Paisley, Canal Street, Port Eglinton. 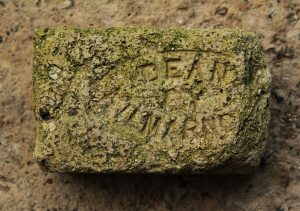 1882 – Speirs Gibb & Co, Brick and Tile Drain Makers, Caledonia Fireclay Works, Paisley. Below – 13/08/1883 – Aberdeen Press and Journal – Buchan’s Patent infringements by Hurlford Fireclay Works and Caledonia Fireclay Works. 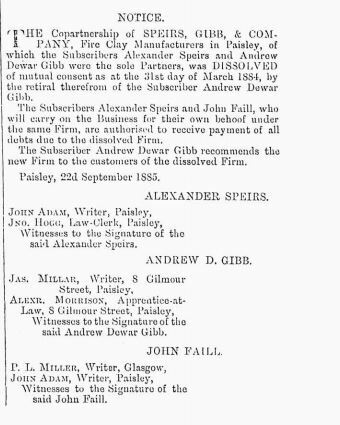 Below – 25/09/1885 – Edinburgh Gazette – 31/03/1884 – Speirs and Gibb dissolved due to retiral of Andrew Dewar Gibb, Alexander Speirs and John Faill will continue the partnership. 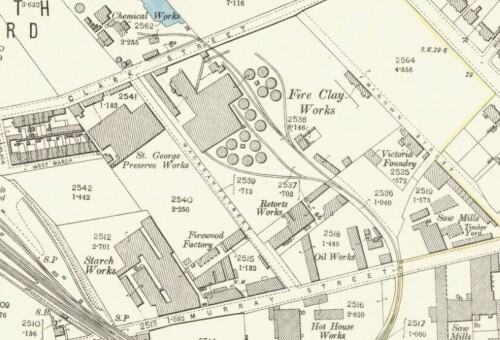 Speirs, Gibb, & Co., fire clay manufacturers, Caledonia Fire Clay works, Burgh lands, off Greenock Road. Speirs, Alexander, of Speirs & Gibb — house Greenhill. Below – 07/07/1888 – Paisley Gazette – Glasgow exhibition. Messrs Speris and Gibb, Caledonia Fireclay Works, Paisley. This firm supplied the sewage pipes used in connection with the extensive drainage arrangements of the building and grounds and also the fire clay coping covering the walls of the terraces and picture galleries of the exhibition. 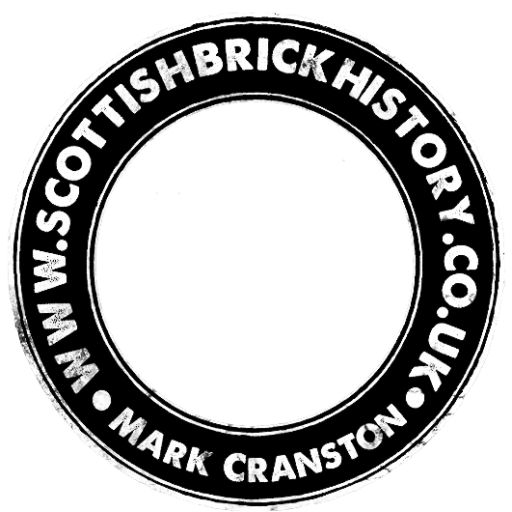 05/10/1889 – Paisley Gazette – Dean of Guild Court – Plans were passed granting authority to Messrs Speir Gibb and Co, Caledonia Fire Clay Works to erect a two storey brick building in McKean Street to be used as a store. Below – 05/07/1890 – Paisley Gazette – Caledonia Fire Clay Works annual outing – Ardrossan. 18/11/1892 – Dundee Evening Telegraph – Bankruptcy of Pailsey Coal Merchant – Alexander Speirs, of Speirs and Gibb, coal merchants, Paisley, was examined to-day in the Paisley Bankruptcy Court. He stated that during the past year be had lost in business £42,000. Had it not been for these losses would have been to-day worth £36,000. Below – 1896 – Caledonia Fireclay Works . 20/03/1896 – Ross- shire Journal – Spiers Gibb & Co Caledonia Fire Clay Works, Paisley Largest manufacturer in Scotland of all kinds of fire clay goods, including salt glazed sewerage pipes, fire bricks, flue covers, flooring tiles, stable bricks, cattle troughs, chimney cans, vent linings. Goods dispatched same day as ordered. Representatives for North Of Scotland John Fraser, Ironmonger, Dingwall. Below – 1912 – Caledonia Fireclay Works. 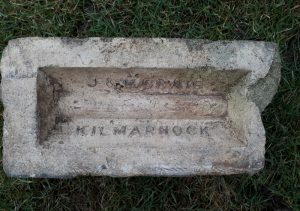 31/07/1917 – Daily Record – The death was reported yesterday of Mr John F Baird, Edgehill, Castlehead, Paisley who was well known in Glasgow and local business circles and had been for a time a dirctor of the United Collieries Company, the Kelvinside Brick Company, the Cleghorn Terracotta Company Limited besides having been managing director at Speirs, Gibb & Company’s Paisley works and for a period chairman of Messrs McGee Ltd, Engineers. He was a member of the Parish Council and for a period chairman. 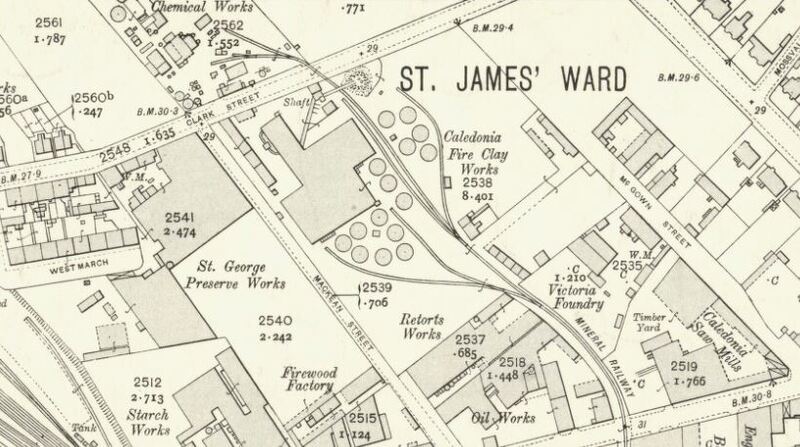 The works do not appear to be present on the 1938 OS Map. 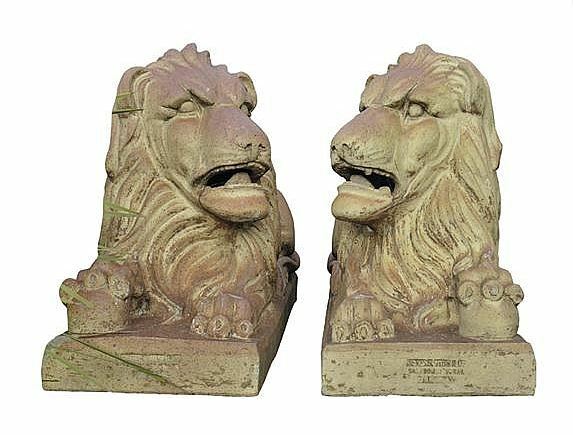 Description: A fine pair of 19th century English glazed terracotta lions. Manufacturers stamp for Speirs, Gibb and Co, Caledonia Works, Paisley. In seated positions, some remnant glaze, each with a factory stamp to the front of the plinth base, supported on green straight sided iron pedestals, 119 x 77 x 41cm each. Previous Article North East Scotland - Brick Clay deposits.